On final approach in thick fog, the twin engine aircraft crashed short of runway and was destroyed. All three occupants were killed. 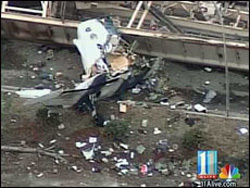 The aircraft was making a private flight from Pahokee (Florida) to Lawrenceville-Gwinnett County airport, Georgia. At the time of the accident, vertical visibility was 100 feet with fog. The aircraft was owned by the American Tennis Association.